John Teller (Van Bergen) is a reporter who primarily covers sporting events, and he heads down to South America on assignment, along with his photographer partner, Bob Norton (Wilson). These two buddies get more than they bargained for when the small country they end up in ends up in the midst of an “overthrow”. Apparently communists are vying for control against the cocaine barons, and, as we’ve all seen many times before, a new “El Presidente” must be installed so a kind of peace can return to the country. That’s why the mysterious Shaw (Law) is involved. Apparently he’s an ex-CIA mercenary who causes governments to collapse. He’s a dangerous man, as Teller and Norton are about to find out first hand. Will Teller live to tell his tale? Here we have another mainstay of video store shelves in the 80’s: the “El Presidente” slog. We have yet to come across one that is actually, solidly good, and when the best example of the genre is Cocaine Wars (1985), you have a problem. Although, to the movie’s credit, if you read the back of the box, at least they’re honest about their intentions: they even use the phrase “El Presidente”! We found that amusing because we coined the term “El Presidente movie” (or slog as the case may be) - way before coming across Overthrow at a local video store (in the adult section no less - our guess is that the owner was trying to hide the movie, so that he might spare the time of potential viewers). 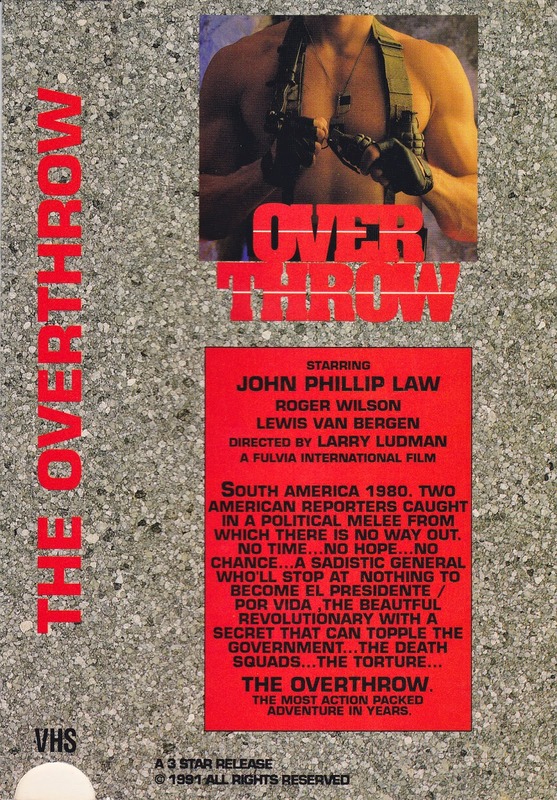 While there’s nothing “adult” about Overthrow, the movie does play out like a stupider Salvador (1986), except this time around, our two “heroes” are about as likable, interesting, complex, tough, manly or inspirational as two bags of styrofoam packing peanuts. Lewis Van Bergen, if that’s his real name, refuses to take off his suspenders, whether he’s wearing a shirt or not. The man is truly dedicated to keeping his pants up. But thanks to his resemblance to TV’s Mark Linn-Baker, as well as his appearances in this, Savage Dawn (1985), and Street Knight (1993), that officially makes him the Larry Appleton of action. A title to hold dear to your heart. A significant amount of the movie’s time is spent on the Prerequisite Torture of Teller and his pal Norton. But director De Angelis, using his standard nom de plume Larry Ludman, was not able to give this movie any spark, unlike the car battery clamps used on our unfortunate protagonists. By far the best character in the movie is an elderly man named Kerslake. Unfortunately we don’t know the name of the actor who portrayed him. In just the same way that Wynn Irwin stole the movie Bloodfist VI: Ground Zero (1995) simply by being an angry, crotchety, and dare we say “grumpy old man”, here too Kerslake does the same. It’s all about Kerslake as he blows away the two dudes who are supposed to be the heroes in the acting department. With his powder blue suit, wide tie and utter resemblance to Phil Rizzuto, you think at any moment he might encourage someone to come down to the Money Store. But as for the movie as a whole, there is some shooting and mild blow-ups, and the Stefano Mainetti music is nice, but the entire affair is just so blah, the low quality of the VHS (it was released by 3-Star Video, who also released fellow Italian production Cop Game (1988), but not much else) only reinforcing the matter. Whether the dubbing also contributes to your hatred of the proceedings depends on your tolerance for such things. 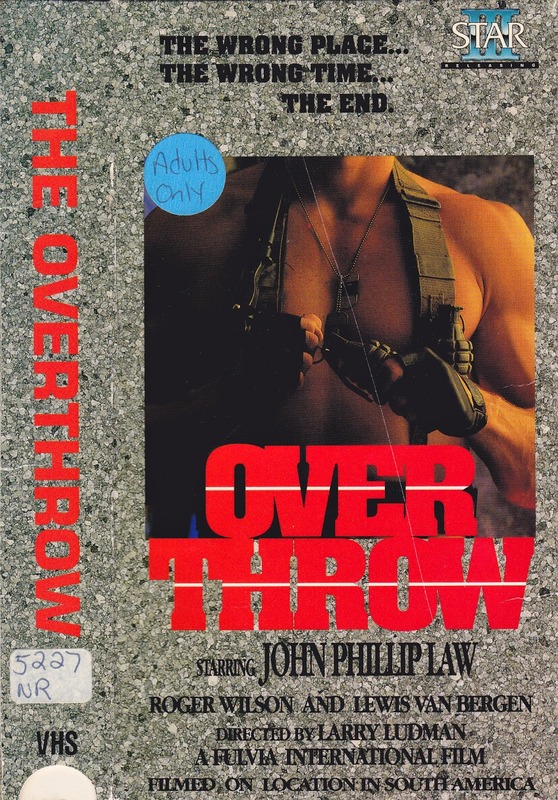 John Philip Law (or JPL as we call him) doesn’t do all that much, finally putting the last nail into the coffin that is Overthrow. We say avoid. If you want to see a really good El Presidente film then I would highly recommend McBain. I thought this one was pretty decent though, Bergen, Wilson and Law were all pretty good IMO. This was a tough sit for us. McBain had a great beginning, but then it slowed to a crawl.